It is no mystery that Los Angeles is a town of many sights and destinations. 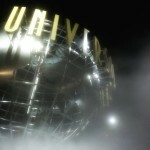 Whenever people travel to the city of Angels, the one place that so many want to see is Hollywood. While there is so much to do, most of the sights in Hollywood do not require a full day’s attention and are close enough that they can be visited in the same trip. In fact, it is almost more fun to do it in a tour like manner, because at the end of the day, you will feel like you’ve had the ultimate Hollywood experience. This list is designed to give you an organized plan for seeing the sights to maximize your day. I recommend getting a somewhat early start to ensure that you would hit all the destinations without worry of closing time or sunset. Arriving at your first destination around 9 or 10 is enough to see all 8 on this list. There is a more detailed map at the end of the post for driving instructions. This cemetery is the final resting place of many great Hollywood legends. Most are from Hollywood’s golden days and may not be familiar to younger generations, although there are some names that are more recognizable, such as Mel Blanc, known as the man of 1000 voices, including Bugs Bunny; Estelle Getty, most recently known for her role as sassy senior citizen Sophia in the 80’s Golden Girls; and Mickey Rooney. The cemetery welcomes visitors, and even sells a map in the flower shop for $5 to help you find the graves of the famous, or you can just casually drive through and enjoy the classic style of the grounds. It is hip and retro, and worth a visit in your day. Leaving the cemetery, turn right(east) onto Santa Monica Blvd., then turn left onto Van Ness Ave. Stay on Van Ness until Sunset Blvd., then turn left (west) onto Sunset Blvd. If you are a music buff, you can stop at Amoeba Records, which you will be passing. It is on the left side. You will turn right onto N. Orange Dr., which is the street just past Highland Blvd. You will see Hollywood High School on the right, and an In-n-Out on the corner. Lunch anybody?? There are a couple parking garages off of N. Orange Dr., one on each side of Hollywood Blvd., however the cheapest parking is inside the Hollywood and Highland garage, where you can get the first 2 hours free with validation from one of the shops inside the Hollywood and Highland shopping center. There is an entrance on the north side of the Blvd, from N. Orange. You will see signs for $2 parking. I recommend parking in a garage to save time and energy, unless you are lucky and easily find a spot on the street. Hollywood Blvd. 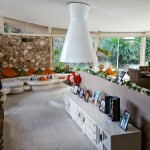 has several iconic Hollywood destinations, all located within the block between N. Orange Dr. and Highland Blvd. 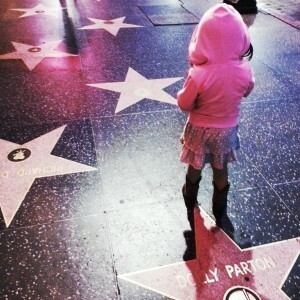 You can’t miss the stars that make up the Walk of Fame, since they run up and down Hollywood Blvd. On the south side is the Jimmy Kimmel theatre, the El Capitan Theatre, and Ghiradelli Soda Fountain (formerly Disney’s Soda Fountain, but still has partnership with Disney, including selling of collectables). Crossing over to the north side at Highland, there is Hollywood & Highland, basically a distinct looking shopping mall. Then the Dolby Theatre, home of the Oscars, followed by TCL Chinese Theatre (formerly Grauman’s, then Mann’s). In front of the Chinese Theatre are footprints of many famous celebrities, dating all the way back to the opening of the theatre in the 1920’s. Visiting a museum is optional, but it does have that unique Hollywood experience. 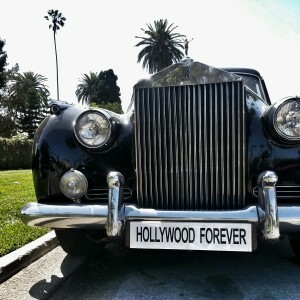 The Hollywood Museum is a large museum with all kinds of great Hollywood memorabilia. It is located near the corner of Hollywood and Highland. They are open Wednesday through Sunday from 10am to 5pm. It is perfect to soak up some Hollywood history. Perhaps you want to take fun pictures with your favorite stars, then Madame Tussauds will be a fun place to check out. It is all about taking pictures there, so have fun and snap some fun ones. It is located at the corner of Hollywood and Orange. After leaving the parking garage, head north again on N. Orange Dr. until it ends on Franklin Ave. Sitting atop the intersection of N. Orange and Franklin Ave. is the exclusive Magic Castle. Turn right onto Franklin Ave. Turn left onto Highland Ave, making sure to stay in the outside lane on the right side for the left turn, since you will need to quickly turn right to continue east on Franklin Ave. Stay on Franklin, then turn left onto N. Beachwood Dr. Turn left onto Ledgewood Dr. Staying on Ledgewood, you will need to make a quick left, then a quick right to continue to stay on Ledgewood. Follow Ledgewood, eventually it will merge and become Mulholland Hwy. The road will start to descend, as you approach the next destination. 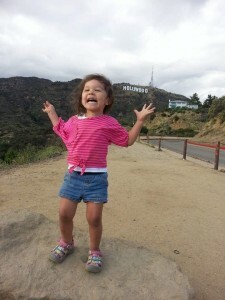 It is your chance to shine under the Hollywood sign! This is a great place to see the Hollywood sign and one of the closest, at least from the front. The sign is protected and not accessible by car, or even foot. There is a trail that gets you close from behind, but that would require a hike. There is a great landing at Lake Hollywood Park just at the bend of the road where most people like to stop and take pictures. There is a dog park in the grassy area down the hill. On the other side of the road there is a good view of the Hollywood Reservoir. Continue down the hill, turning left onto Tahoe Dr. It will turn into Lake Hollywood Dr. At the end, turn left, still called Lake Hollywood Dr. Go right on La Suvida Dr., and then right back onto Lake Hollywood Dr. for just a short distance until you get to Barham Blvd. Take Barham Blvd. to Forest Lawn Dr., turning right. Continue on, passing Forest Lawn Hollywood Hills. Just before the freeway, turn right onto Zoo Dr. At the stop sign, go straight into the next destination. 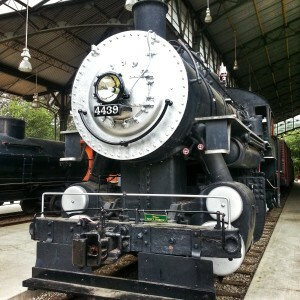 This is a fun place to see old trains and take some fun pictures. You can even ride a mini train! Just be aware of the time for this stop, since it does close at different times, sometimes as early as 3:30, depending on the day and time of year. This is one of my favorite places to take unique family photos, and you may even spot professional photographers shooting their subjects for special occasion photos. When leaving Travel Town, turn left onto Griffith Park Dr. for awhile. After passing the golf course a little way, watch out for an open area that has a triangular shape. You will be turning right. Unfortunately there is no name of the street, but it will go back a little with parking on the left side facing a park. If you see the big children’s play area, you’ve gone too far. Find a place to park, the rest of the way is by foot. Walk into the park staying on the path that seemingly goes into the hills. There are a lot of trees around. Once you walk up the path, you will see the big clearing in what used to be the old zoo. Before the current LA zoo was built, there was the old zoo. The animal cages are still there, giving a unique backdrop for fun photos. The movie Anchorman had a scene that was shot there. This place is a favorite to many in Los Angeles. 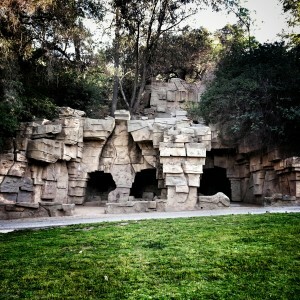 When leaving, head back out of the parking area to Griffith Park Dr. The next street will be at a stop sign, and there will be signs posted for the carousel. This was the carousel where Walt Disney sat on a park bench and got the inspiration for Disneyland. It is still operating today, but has very limited hours. Continue on Griffith Park Dr., turning right onto Los Feliz Blvd. Turn right onto Vermont Ave. There are many beautiful homes in this area to admire. The Greek Theatre will be on the left. Keep going up the hill. You will go through a tunnel that may look familiar, since it was used in the filming of Back to the Future and Who Framed Roger Rabbit. After the tunnel you will head up the hill to find parking. Keep in mind that the lot can be full at times, and may need to park down the hill instead of the observatory lot. This is perhaps one of the most iconic places to visit in Los Angeles, with tremendous views of the city, and another view of the Hollywood Sign. There is plenty to do and see here, and is especially beautiful at sunset, The evening is just as beautiful, when all the city lights are on. There are lots of interactive exhibits and is perfect for any type of interest. When leaving, continue down the hill, back down to Los Feliz Blvd and then turn right. It will eventually curve to the left. Turn right on Franklin, left on Van Ness, making a quick right onto Hollywood Blvd. before making a right onto the 101 freeway north. Also you can keep an eye open for signs that say 101 North. Take 101 for just a few short miles and exit on W.C. Fields Dr. From here just follow signs for Universal Studios and Universal City Walk. There will be a $15 parking fee. 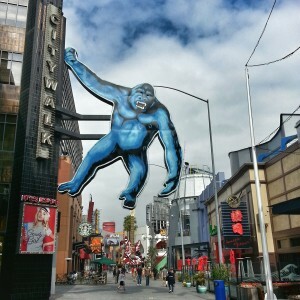 If you are not planning on spending a day at the theme park, then Universal City Walk makes a great close to a marathon day of sightseeing. Enjoy the lights and entertainment, and have dinner at one of the many restaurants. Sit, enjoy, and relax while recapping your favorite highlights of the day. 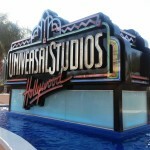 Universal City Walk is a popular Los Angeles destination that is sure to be the perfect finale. Now, if you can’t wait to get here, Click Here for the Best Los Angeles Hotel Deals! 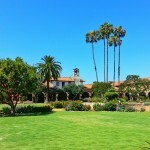 Save on California Attractions in Los Angeles, San Diego, and San Francisco! 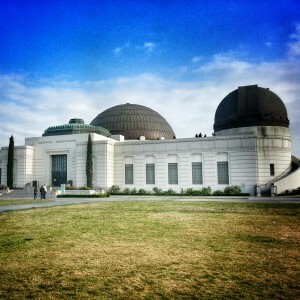 Family Friendly, Griffith Observatory, Hollywood, Hollywood Forever Cemetary, Museums, Photography, Southern California, The Old Zoo, Travel Tips, Travel Town, Universal Studios. Bookmark.